The gift of life is everything you have. Your mother bestowed life upon you, and thus you showing her how grateful you are for her is incredibly important. Her unconditional love for you has pushed you forward and granted you with limitless possibilities. The strongest desire of a mother is to build up her child with the greatest character, and it's time to prove the success of your mother. With this gift, she will know that she is continuing to guide you in the right direction on your journey of life. You’ll truly make her proud. When you present her with flowers, she just gets so happy… not because they’re so pretty, it’s because it shows how much you care. You went out of your way to make her happy, that’s the true gift. Now this will make her heart burst with joy, and top the flowers from every angle. Your mother presented you with the beauties life has to offer. You have a future and life can take you wherever it wants to… thank your mom for that. But words don't speak as loud as actions. So what is the ideal way to prove your gratitude towards your mother, to prove how amazing she is as a parent? Well we are here to make that easy for you. What better way to appreciate your mother’s parenting by carrying out her actions to other children? 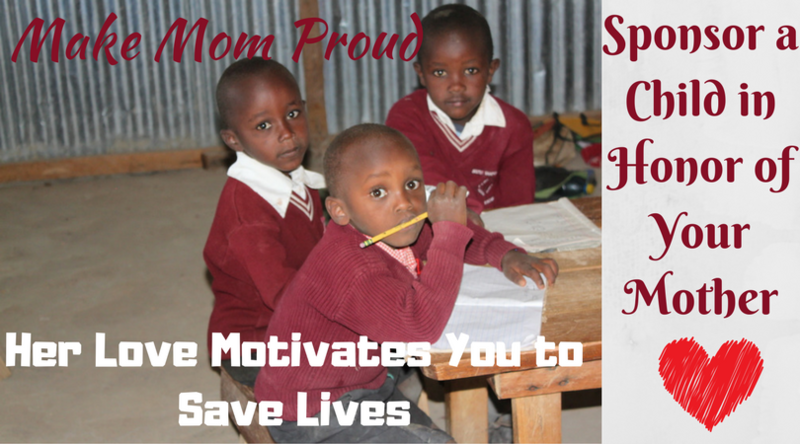 You could prove just how amazing she is as a parent by sponsoring a child’s education. In doing this you are giving the child endless, limitless opportunities, the way your mother did for you. You could demonstrate the truth of her beliefs she established in you by donating in her honor. This means you're saving a kid’s life, as monthly donations make the most crucial difference in these children’s lives. Even $5 a month will make miracles for a child, and a monthly donation of $25 will save countless lives. All it takes is a small sacrifice, but the reward is beyond measure. If your mom thinks you should spread kindness, and value love and compassion over materialistic items… then why not prove her lesson lives within you? I find it extremely difficult to find a gift that gives more to your mother than this one. Each month you make a sacrifice in her honor to make the world a better place. She will certainly be in awe and impressed with how far you go for the sake of her happiness. She will know what a great parent she is, witnessing the magic of her beloved child’s actions. This is as special as it will ever get. Take Mother’s Day to the next level by donating monthly to Humans for Education in honor of your mother.